Problem: School security is at the forefront of every administrator's mind as security threats become a consistent part of the conversation. While lockers are often necessary for students to store heavy books or expensive laptops and tablets, they can be a contraband risk. How can a district or facility balance the need for personal storage and administrative oversight? 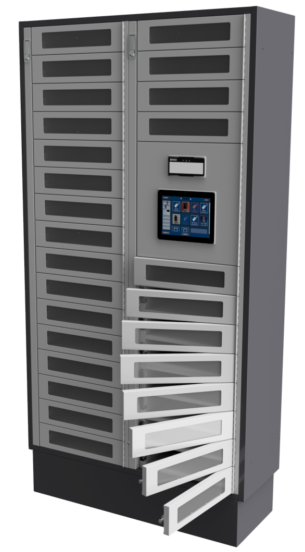 Solution: Asset Control Lockers integrate with your existing access control system, making it a part of your security system. With the touch of a button, open or lock down lockers. Discover which student is using which locker, where, and when for fast response. Using multi-user lock solutions, offer an open lockers to students on days they need lockers, where they need them, rather than tie up costly administrative and maintenance processes checking out lockers and updating combinations. DeBourgh’s Experience: DeBourgh has partnered with the all the top-end lock companies, offering the integration and interface you want with classic DeBourgh strength. Be a part of the evolution of personal storage. If you’re looking for this solution, something similar, or a partner with expertise in fabricating metal lockers for turnkey operations, please contact us below!